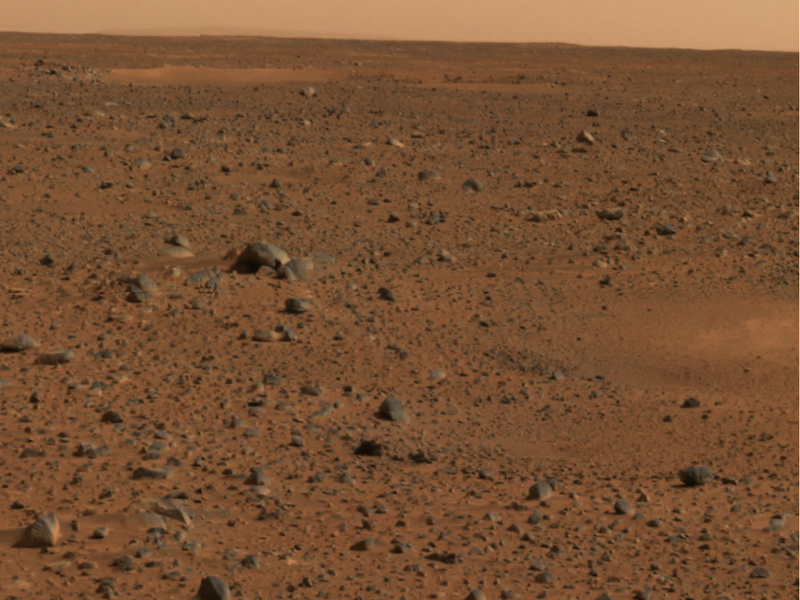 Martian horizon captured by the Panoramic Camera on the Mars Exploration Rover Spirit. 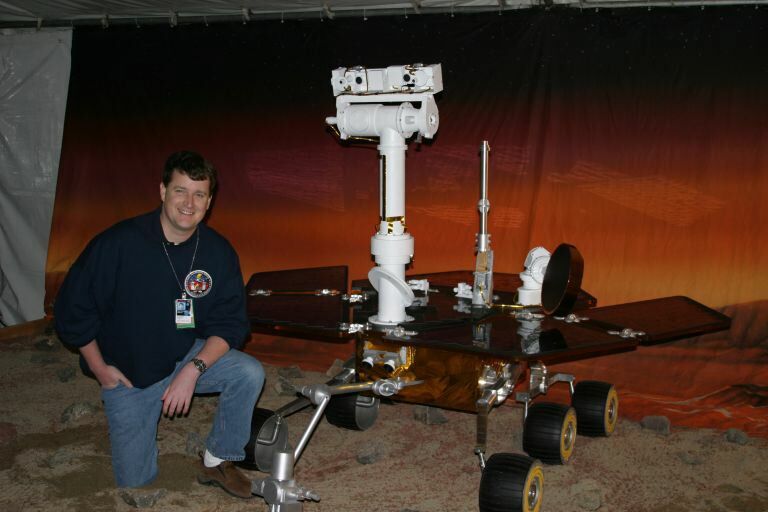 "Scientists have a crush on Mars, and it's hard not to look only for things we want to see," says Mars Exploration Rover scientist, John Grant, from Washington D.C.'s National Air and Space Museum. For two years, scientists have wanted to come to Gusev Crater because pictures and data taken from the Mars Odyssey and Mars Global Surveyor orbiters have shown evidence that a river may have once flowed into the crater. Now that Spirit has safely landed in Gusev Crater, scientists must interpret the right clues that will lead them to understand the geologic processes that formed the area. "We've talked about Gusev Crater being a dry lake bed for so long, there's a danger of getting trapped into believing only in that possibility," warned Grant. Scientists are forcing themselves to be patient as they begin gathering clues to figure out how this site formed for sure. "To be trite, you can't judge a book by its cover," explains Jeff Moersch, participating scientist from University of Tennessee. There can be multiple explanations for the same geologic observation. 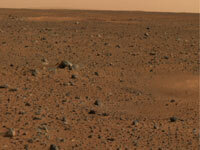 "For example, take a look at these two pictures on Earth, which look very similar to Spirit's landing site on Mars. Look at the shapes of rocks in the pictures, the size of rocks, the number of rocks in a certain area or the ‘rock distribution' as we geologists say," said Moersch. At first glance, these two places on Earth look similar, and one could assume the same geologic processes formed the landscapes. However, geologists have gone to these two places on Earth and discovered they were formed in different ways. The Haughton Impact Structure is a crater in the Canadian Arctic and is roughly 23-million years old. The bottom of the crater flooded and a lake formed inside the crater. Some of the rocks are scratched in a way that tell geologists that glaciers probably transported the rocks into the crater later. 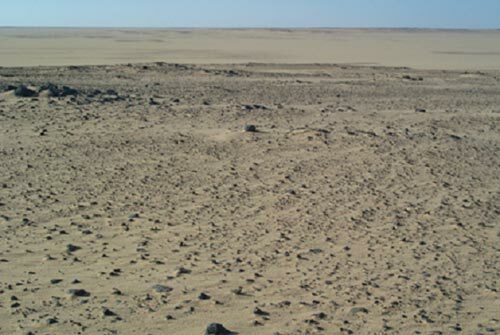 At a glance, the landscape in the Saf Saf area in Egypt looks similar to the Haughton Impact Structure. The Saf Saf landscape, however, doesn't have anything to do with an ancient lake. Although one's eyes are drawn to the flat area, similar rock angles, the rock distribution, the light soil, and further subtle clues observed by geologists revealed that no water ever flowed where the rocks are scattered in Saf Saf. A river only flowed behind the rocks in the smoother area up above the rocks. John Grant standing beside a model of the Mars Exploration Rover. "When I first saw the pictures from Mars, I caught myself saying, ‘I know this place,' because it looked like places I had seen on Earth," said Grant. "But, we're being very cautious right now because we know we have never seen this place before, and we must wait for the other instruments such as the Microscopic Imager and Mössbauer Spectrometer to reveal better clues about this landscape," explained Grant. "If we only had pictures of the landing site, we scientists would argue for decades and maybe never know for sure how this place formed," said Grant. Jeff Moersch posing beside a model of his current favorite robot. 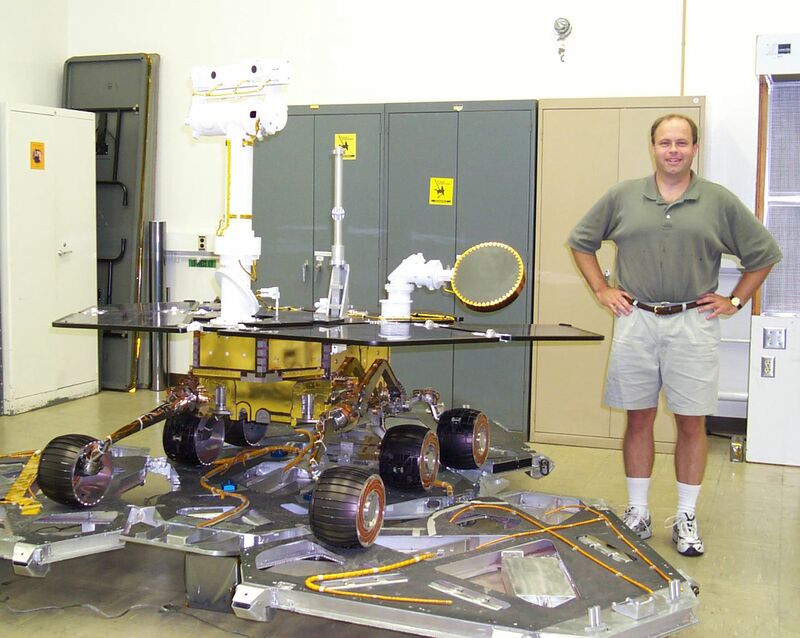 "This is like a book that is being read," explained Moersch, and the science team is working hard not to judge this martian book by its cover. "Like good detectives, we are looking at everything we can and gathering as many clues as possible to see if water ever was in this crater long enough to provide an oasis for life," said Moersch.